Rich Strolis grew up in the foothills of the Berkshires of Western Massachusetts where he cut his teeth on the plethora of smaller and larger bodies of moving water. Post college and while juggling another demanding career, he became recognized as a guide on the ever popular Farmington and Housatonic Rivers in Connecticut for the better part of 10 years. He later transitioned his work to commercial tying, speaking engagements and teaching many facets of both fly fishing and fly tying across the Northeast and Eastern seaboard. 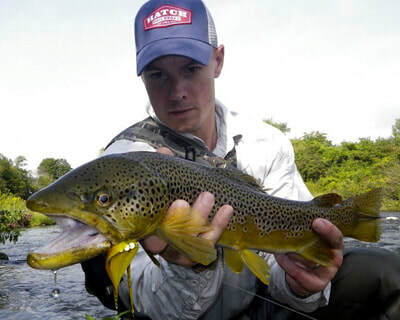 His fly patterns although based out of the Northeast, have a strong following and relevancy across the globe and have been tied and fished by many as a result of his library of online videos. He is a signature fly designer for the Montana Fly Company, which currently produces over 25 of his patterns. His patterns have appeared in several national magazines and books, including Flyfisherman, Eastern Fly Fishing, Strip Set, Fusion Tying, Caddisflies and 50 Best Places, Fly Fishing The Northeast to name a few. His first book was released in January 2016, Catching Shadows Tying Flies For The Toughest Fish And Strategies For Fishing Them which details a wide cross section of his patterns and was a top 10 seller in its first year on the shelves. Rich is currently a Pro Staff member and advisor for a wide array fly tying and Flyfishing companies including Regal Vise, Partridge hooks, Solarez UV resins, Enrico Puglisi materials, Hatch premium fly reels, and Flycraft. Rich is a very well rounded trout fisherman, but his passion lies in chasing trophy trout and various other apex predators on streamers with a pretty impressive list of locations he’s fished outside of New England. He lives in Simsbury, Connecticut, with his wife, Megan, and two daughters, Tessa and Nora. You can see more of his work at his website: www.catchingshadows.com.